Whether it's having to remove tags from clothing or using special dimmed lighting when they study, kids with sensory disorders or special sensory needs often need adaptations in their everyday lives in order to find success in school and beyond. 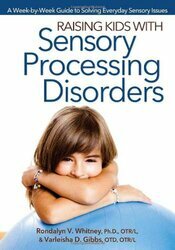 Taking a look at the most common sensory issues kids face, Raising Kids with Sensory Processing Disorders offers a compilation of unique, proven strategies parents can implement to help their children move beyond their sensory needs and increase their performance on tasks like homework, field trips, transitions between activities, bedtime, holidays, and interactions with friends. Written by a parent of two children with very different sensory needs, the book shows parents how to characterize their child's sensory issues into one of several profiles that they can then use to find the best adaptations and changes to their everyday routines. Rondalyn Varney Whitney, PhD, OTR/L, FAOTA, is an occupational therapist, educator, and researcher with over 20 years of experience. Her work focuses on the family as a system and she specializes in pediatric mental health and reducing barriers to family quality of life for families of children with autism and related disorders. Dr. Whitney is a prolific author, including Nonverbal Learning Disorder: Understanding and Coping with NLD and Asperger's (TarcherPerigee, 2008); Raising Kids with Sensory Processing Disorders (Prufrock Press, 2013); and Self-Regulation: A Family Systems Approach for Children with Autism, Learning Disabilities, ADHD & Sensory Disorders (PESI, 2014). She is a featured author in The Out of Sync Child Has Fun (TarcherPerigee, 2006), Sensory Focus Magazine, Today in OT and OT Practice. Dr. Whitney presents nationally and internationally on ASD, sensory processing, family quality of life, therapeutic humor, social skills program development and related topics. She is a pioneer of innovative social programs which serve as a model for many programs utilized today. Dr. Whitney is a recognized leader in the American Occupational Therapy Association and a recipient of multiple awards for excellence. She is certified in the Sensory Integration and Praxis Test (SIPT) and has an advanced practice designation in Feeding and Swallowing from the state of California. Dr. Whitney is an associate professor and chair of the OT Department at the Clarkson University in the North Country of New York. Her research interests are in family quality of life, family resilience, and sensory processing as a barrier or support to social participation. Varleisha Gibbs, PhD, OTD, OTR/L, is an occupational therapist with a passion and expertise in developmental and neurological conditions. She has dedicated her career to connecting science to practice and advocating for family-centered approaches. She is the inaugural chair/director, and associate professor of the Master’s of Occupational Therapy at Wesley College in Dover, Delaware.